I’m entering into a contest* this week sponsored by the fabulous Kristina at Pretty Shiny Sparkly . The contest is titled Arm Party- and the assignment is to stack as many bracelets as possible on. I guess this is the new trend~I’m learning as I go!! So crack open the champagne, here is my Arm Party! 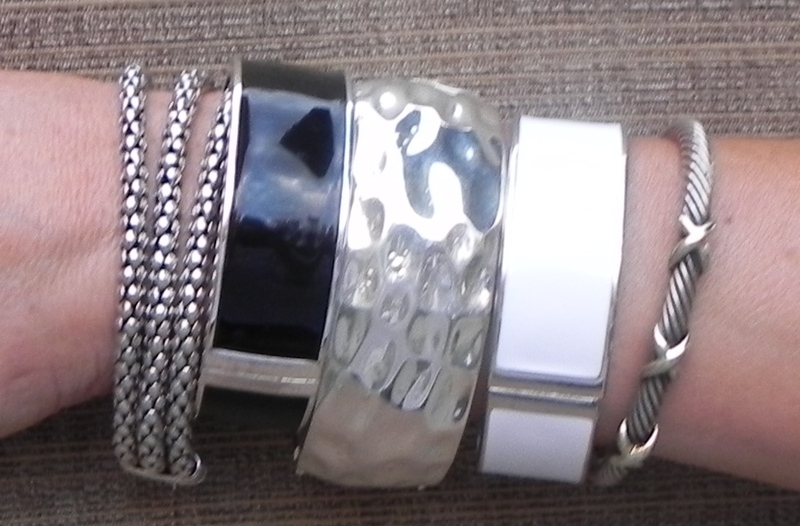 I’m wearing a combo of bracelets, the one with 3 chains is Silpada; the black, white and silver are all from Kohl’s and the small braided one is David Yurman. Let me know what you think! Is this something you you’ll try? * Leave it to me- I was late for the party… the contest ended August 3rd. Oh well, I had fun trying! I’d still love your comments and feedback. If you click on the picture above it will take you to the site of the party and you can see a bunch of other examples of bracelet stacking. I love that! Then you have to cut back on the necklaces and earrings, right? We wouldn’t want to over do it! You are crazy, Mary L! Why would you want to cut back on other jewelry? The more, the better!!! I think you both are crazy! Hee Hee! Actually, although I love this look- it really isn’t practical for me. Try typing, folding laundry or unloading the dishwasher with a stack of bracelets. Not happening! Maybe it’s more of an evening look, I’ll try it next date night!